MELKSHAM Town Council has approved ‘exciting’ plans to revamp King George V playing field. The first phase of the plans – which the council is hoping will be completed by the summer – include outdoor gym equipment, a sensory garden, a new path and extra seating, along with the splashpad which had already been planned. Other plans include a cafe, all-weather informal sports surface, a nature trail and the children’s play area being relocated from the flood area of Clackers Brook to close to the cricket pavilion. At an extraordinary town council meeting this week, councillors voted to adopt the master plan for the park and agreed the phasing of works. ‘Phase 1A’ of the project aims to deliver by this summer: a splashpad by the cricket pavilion; improvements to the main path, creating a clear route around the playing field; outdoor exercise equipment; a paved area in front of the cricket pavilion; services for events including a temporary stage; outdoor seating; and a tree walk sensory garden on the walk that runs parallel to Lowbourne. Other improvements will be introduced in phases over the coming months as soon as possible, but at present there is no fixed timescale. ‘Phase 1B’ will see the relocation of the adventure play area to alongside the skate park, and the children’s play area being moved out of the flood area of Clackers Brook, relocating it close to the pavilion. ‘Phase 2’ will introduce a café, changing room and toilet facilities at the cricket pavilion. ‘Phase 3’ will see the installation of an all-weather informal sports surface in the south-west corner of the park; improvements to the car park behind the pavilion; and the creation of a nature trail next to Clackers Brook on the site of the current play area. At this week’s meeting, cllr Hayley Spencer-Illman said, “This master plan is a fantastic evolution for our park, for its future. It’s not just about what may or may not be needed now, it’s about what is needed for the future as well. “This isn’t just for the residents today, it’s for the residents of tomorrow, for those children that are going to be adults and then parents as well. 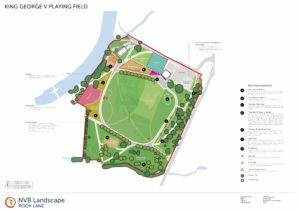 The master plan for the park has been created by NVB Landscape, who were appointed by the town council to design and oversee the creation of a plan for the park in late 2017. The proposed changes have come from ideas shared by the Melksham community and the town council at consultation events held last year. Over the course of 2018, hundreds of people have fed back into the plans, letting planners know what you’d like to see and what you have liked or disliked about the emerging plans. Community engagement manager for the town council, Debbie Bentley said, “We wanted to take the time to say thank you, to all of you who have engaged in this process, young and old. Whether you came to a meeting, filled in a form, took time to email/write to us or joined in on social media. Your opinions count and we have been listening. “Some of the things you’ve helped to shape include: the inclusion of a trim trail; the creation of a sensory area; movement of areas due to flooding; the review of toilet provision; provision of a splashpad. 12 councillors voted for the proposals with one, cllr Martin Pain, against. A: Adventure Play Area. A new location for more play equipment for older children, allowing for renewal to take place before old equipment is removed from former location. B: New Sports Facilities. Improved provision of impromptu sports facilities with creation of all weather surfaced area. C: Childrens Play Area. Existing Play area phased renewal to new location, with new location convenient for proposed café and toilet and changing facilities. D: Tree Walk & Sensory Garden. Mature trees retained and new tree planting, surrounded by allow fence/railing to define the area as a passive space where dogs need to be kept on a lead. The Millennium Mosaic could be carefully incorporated into the design along with sensory planting and seating integrated with raised beds. The path could be resurfaced to improve tree health/longevity and to create a distinct character. The Character of the space would be further enhanced with gateway features such as pergolas, gates, archways to give sense of arrival. E: Clackers Brook Nature Trail. An opportunity to improve water quality and flood resilience. Earthworks, new tree and wetland planting to create opportunities for wildlife. Natural and incidental play to be integrated throughout. F: Main Path. Path widened to accommodate shared use by runners and walkers, groups and individuals. Creates opportunity for circular routes around park for walks and running. Fitness equipment distributed along the new path as part of a ‘trim trail’. G: Bandstand. Improved provision of services i.e. electric and data to better support the delivery of events. Portable stage/canopy for smaller events to be considered. Red ‘X’: Services. Power and water for festival use and to supply youth worker gazebo. Pink dots: Trim Trail. A new focal point for the park, With services providing connections for performances and events. Yellow triangle: Gateway Enhancements. New gateway features to define entrance to park.